Siya Kolisi. Photo: Gallo Images. The Stormers and Springbok skipper can now confidently look to spearhead his franchise’s gruelling tour to Australasia. 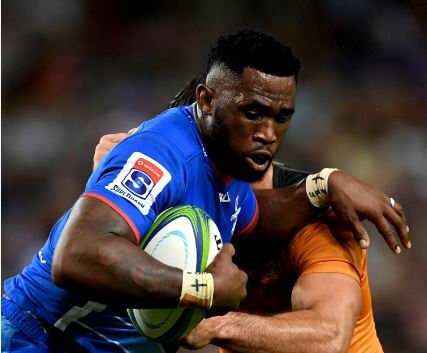 By all accounts, the Stormers won a Test match against the Jaguares at Newlands this weekend given how the Argentinian side is strewn with internationals. As a result, it also means that Siya Kolisi chose very accomplished opponents to deliver his best performance of the Super Rugby campaign to date. The Stormers and Springbok captain was indeed superb during the 35-8 victory, delivering an all-action showing where he carried strongly, showed nifty touches in terms of distribution and was typically robust on defence. A haul of a try, 52 running metres, a clean break, nine tackles and a turnover won proves the point. With the Capetonians embarking on a gruelling four-week tour of Australasia on Sunday, Kolisi’s upturn in form couldn’t have been timed better. “This was one of my better games,” he said. “I feel I’ve been doing alright, I’ve been doing what’s needed of me. This was a game where I had quite a few opportunities with ball in hand and I enjoyed it. As the first Bok skipper to lead the national side to a win in New Zealand last year since 2009, Kolisi and numerous teammates are well aware what’s required for success on their trip. They’ll also face two Kiwi sides – the Hurricanes and Blues – who’ve looked vulnerable at times in this campaign. But the 27-year-old flanker insists the Stormers won’t be making any assumptions over opponents’ form. “We honestly don’t look too much at what other teams are doing in terms of winning or losing,” said Kolisi. Bok lock Eben Etzebeth has been included in the touring party, but will miss the game against the Hurricanes due to concussion. Stormers touring squad: Juarno Augustus, Jaco Coetzee, Damian de Allende, Dan du Plessis, Jean-Luc du Plessis, Pieter-Steph du Toit, Eben Etzebeth, Corne Fourie, Herschel Jantjies, Steven Kitshoff, Siya Kolisi (captain), Michael Kumbirai, Dillyn Leyds, Wilco Louw, Frans Malherbe, SP Marais, Bongi Mbonambi, Salmaan Moerat, Ruhan Nel, Scarra Ntubeni, Sergeal Petersen, Justin Phillips, JD Schickerling, Joshua Stander, Chris van Zyl, Cobus Wiese, Damian Willemse.